Remarkably I had forgotten just how nutty spring can be around here. Tuesday saw hail, heavy rain, sunshine and wind, all within a few hours. My eating patterns (or lack thereof) have been much the same - anything from hot soup and warm muffins to smoothies. My Monday day of eats looked like this - started off with a chia seed banana berry smoothie for breakfast. 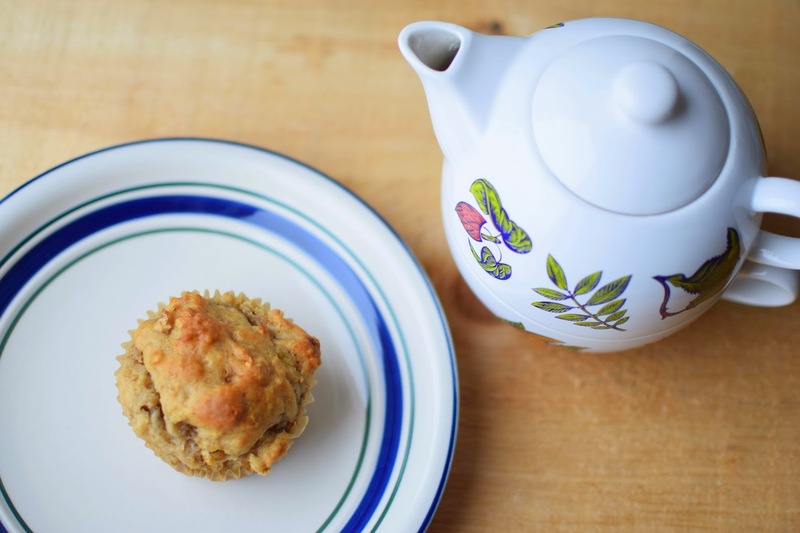 And then something warm - a cup of decaf green tea and a delicious banana nut muffin that I had made from a recipe in Thug Kitchen: The Official Cookbook: Eat Like You Give a F*ck . 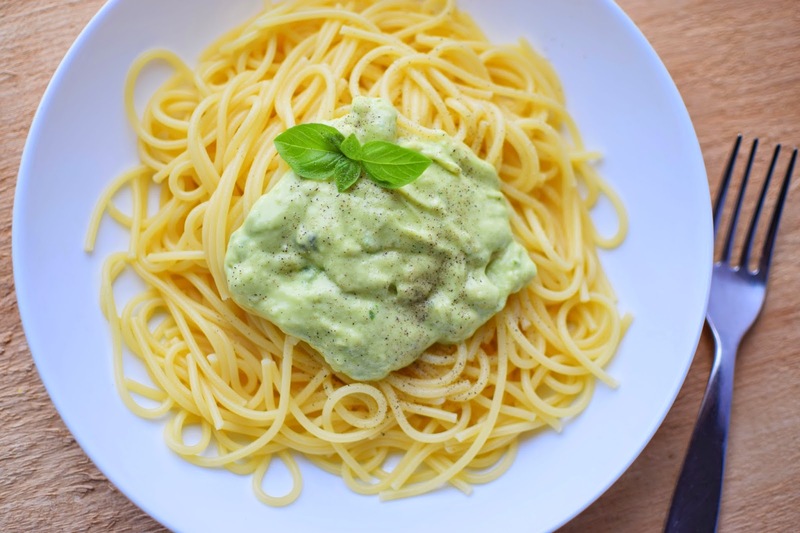 I had no leftovers to heat up for lunch, so I whipped up the quick creamy avocado pasta recipe from The Oh She Glows Cookbook. Nothing like a big bowl of pasta to make things feel right. With many vegan cookbooks in my review pile, I had spent some time browsing them on the weekend. 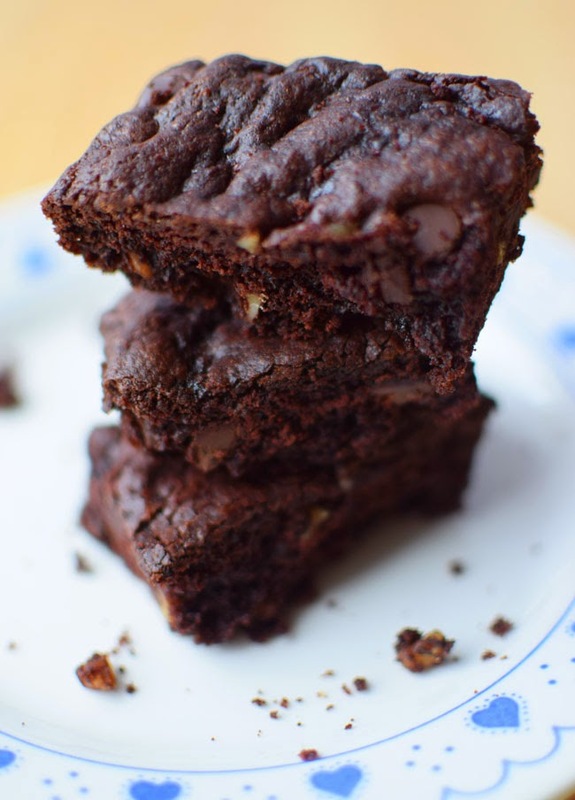 I encouraged my daughter to make brownies from Vegan Junk Food: 225 Sinful Snacks that are Good for the Soul as I called out instructions from the couch. She did an amazing job and the brownies were delicious. I had one for my Monday afternoon snack (and trust me there weren't many left at that point). For dinner, I baked some smoked tofu in a teriyaki sauce. 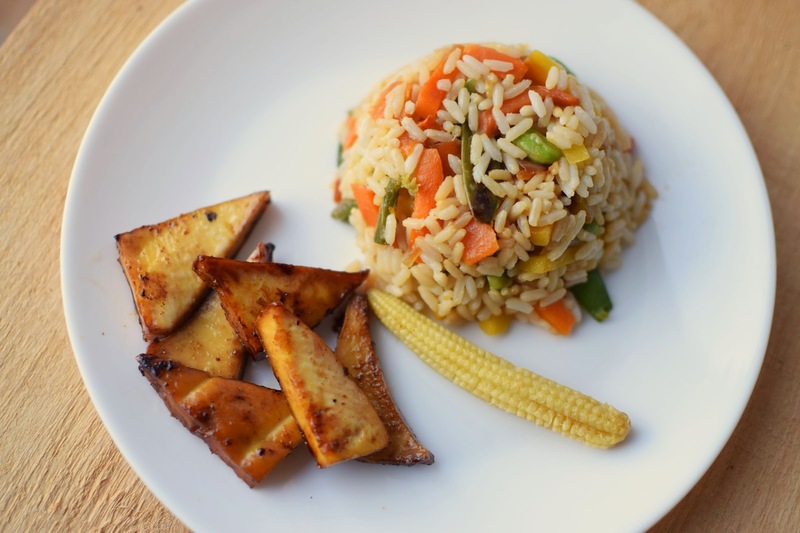 I also made fried rice using a mix of frozen veggies. 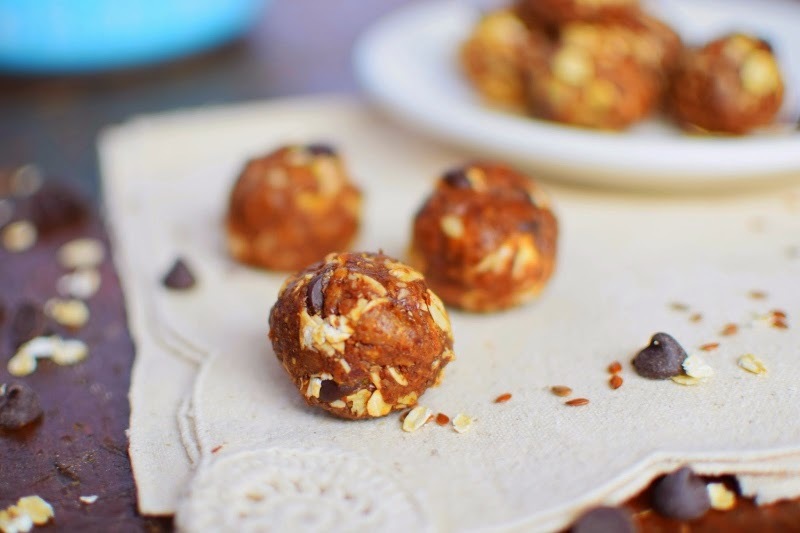 I snacked on a couple of No-Bake Double Chocolate Crunch Peanut Butter Snack Bites straight out of the freezer later. Not a Monday dish, but I wanted to share a look at this delicious soup my husband made a few days back. 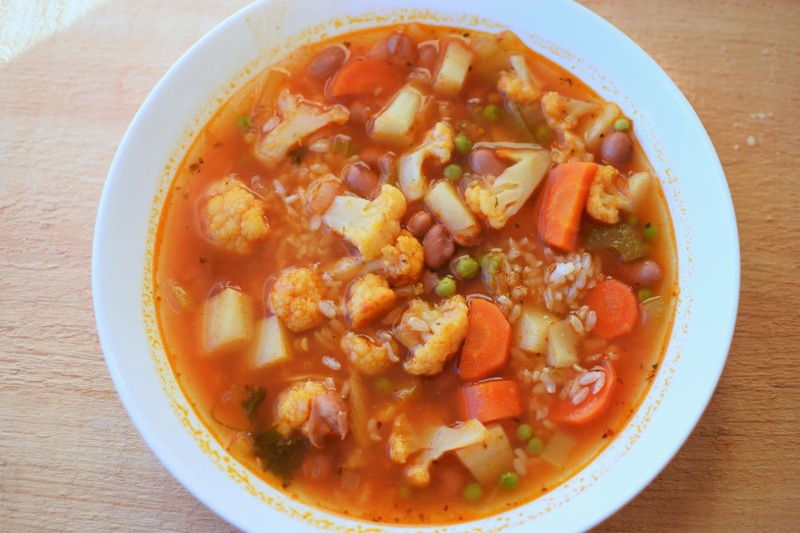 A veggie bean soup with cauliflower. I love cauliflower in soup! Has your eating reflected the weather lately? Be sure to enter these three giveaways! I have two giveaways going on right now that are sure to appeal to you health-lovin' peeps! Enter to win a package of healthy, gluten-free snack options from SimplyProtein AND enter to win a Natural Calm prize pack from Natural Vitality. Oh, and if you just want to win some money (A $150 VISA card to be exact) head over here. I've heard such good things about Angela's cookbook! I definitely need to check it out. I'm not vegan anymore but as a vegetarian I'd still love the recipes! As someone whom is far from vegan, Angela's cookbook is at the top of my to buy list! You're smoked tofu looks absolutely delicious! 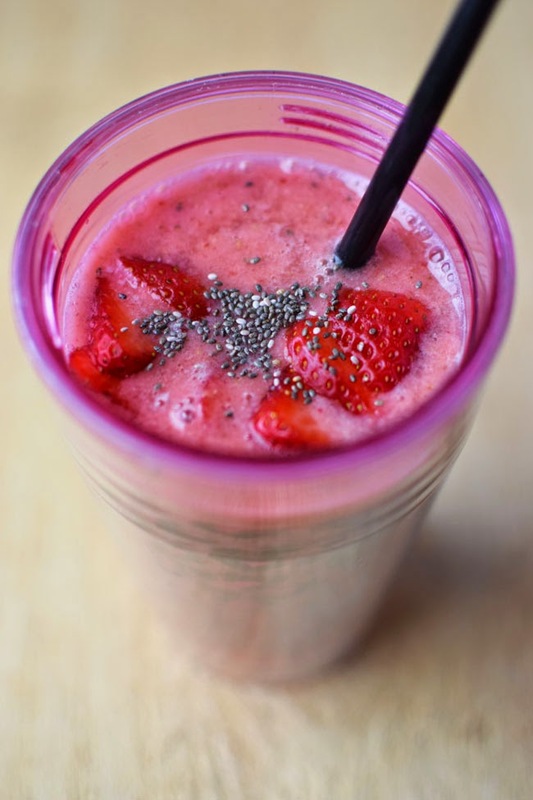 I love the color of your smoothie. So vibrant! And avocado sauce? That sounds enticing and I am headed over to search for the recipe now. We have had hail countless times today! So strange! And yucky!